← Human Cloning, Surrogate Mother and Why Is It wrong? In one of the wildest developments in serious science for decades, researchers from California to Moscow have recently been investigating the possibility of time travel. They are not, as yet, building TARDIS lookalikes in their laboratories; but they have realised that according to the equations of Albert Einstein’s general theory of relativity (the best theory of time and space we have), there is nothing in the laws of physics to prevent time travel. It may be extremely difficult to put into practice; but it is not impossible. It sounds like science fiction, but it is taken so seriously by relativists that some of them have proposed that there must be a law of nature to prevent time travel and thereby prevent paradoxes arising, even though nobody has any idea how such a law would operate. The classic paradox, of course, occurs when a person travels back in time and does something to prevent their own birth — killing their granny as a baby, in the more gruesome example, or simply making sure their parents never get together, as in Back to the Future. It goes against commonsense, say the sceptics, so there must be a law against it. This is more or less the same argument that was used to prove that space travel is impossible. So what do Einstein’s equations tell us, if pushed to the limit? As you might expect, the possibility of time travel involves those most extreme objects, black holes. And since Einstein’s theory is a theory of space and time, it should be no surprise that black holes offer, in principle, a way to travel through space, as well as through time. A simple black hole won’t do, though. If such a black hole formed out of a lump of non-rotating material, it would simply sit in space, swallowing up anything that came near it. At the heart of such a black hole there is a point known as a singularity, where space and time cease to exist, and matter is crushed to infinite density. Thirty years ago, Roger Penrose (now of Oxford University) proved that anything which falls into such a black hole must be drawn into the singularity by its gravitational pull, and also crushed out of existence. But, also in the 1960s, the New Zealand mathematician Roy Kerr found that things are different if the black hole is rotating. A singularity still forms, but in the form of a ring, like the mint with a hole. In principle, it would be possible to dive into such a black hole and through the ring, to emerge in another place and another time. This “Kerr solution” was the first mathematical example of a time machine, but at the time nobody took it seriously. At the time, hardly anybody took the idea of black holes seriously, and interest in the Kerr solution only really developed in the 1970s, after astronmers discovered what seem to be real black holes, both in our own Milky Way Galaxy and in the hearts of other galaxies. This led to a rash of popular publications claiming, to the annoyance of many relativists, that time travel might be possible. In the 1980s, though, Kip Thorne, of CalTech (one of the world’s leading experts in the general theory of relativity), and his colleagues set out to prove once and for all that such nonsense wasn’t really allowed by Einstein’s equations. They studied the situation from all sides, but were forced to the unwelcome conclusion that there really was nothing in the equations to prevent time travel, provided (and it is a big proviso) you have the technology to manipulate black holes. As well as the Kerr solution, there are other kinds of black hole time machine allowed, including setups graphically described as “wormholes”, in which a black hole at one place and time is connected to a black hole in another place and time (or the same place at a different time) through a “throat”. Thorne has described some of these possibilities in a recent book, Black Holes and Time Warps (Picador), which is packed with information but far from being an easy read. Now, Michio Kaku, a professor of physics in New York, has come up with a more accessible variation on the theme with his book Hyperspace (Oxford UP), which (unlike Thorne’s book) at least includes some discussion of the contribution of researchers such as Robert Heinlein to the study of time travel. The Big Bang, string theory, black holes and baby universes all get a mention here; but it is the chapter on how to build a time machine that makes the most fascinating reading. It works like this. According to one interpretation of quantum physics (there are several interpretations, and nobody knows which one, if any, is “right”), every time a quantum object, such as an electron, is faced with a choice, the world divides to allow it to take every possibility on offer. In the simplest example, the electron may be faced with a wall containing two holes, so that it must go through one hole or the other. The Universe splits so that in one version of reality — one set of relative dimensions — it goes through the hole on the left, while in the other it goes through the hole on the right. Pushed to its limits, this interpretation says that the Universe is split into infinitely many copies of itself, variations on a basic theme, in which all possible outcomes of all possible “experiments” must happen somewhere in the “multiverse”. So there is, for example, a Universe in which the Labour Party has been in power for 15 years, and is now under threat from a resurgent Tory Party led by vibrant young John Major. Once again, it sounds like science fiction, and once again science fiction writers have indeed been here before. But this idea of parallel universes and alternative histories as a solution to the time travel paradoxes is also now being taken seriously by some (admittedly, not many) researchers, including David Deutsch, in Oxford. Their research deals with both time, and relative dimensions in space. You could make a nice acronym for that — TARDIS, perhaps? Why Time Travel Is Possible? Relativists have been trying to come to terms with time travel for the past seven years, since Kip Thorne and his colleagues at Caltech discovered — much to their surprise — that there is nothing in the laws of physics (specifically, the general theory of relativity) to forbid it. Among several different ways in which the laws allow a time machine to exist, the one that has been most intensively studied mathematically is the “wormhole”. This is like a tunnel through space and time, connecting different regions of the Universe — different spaces and different times. 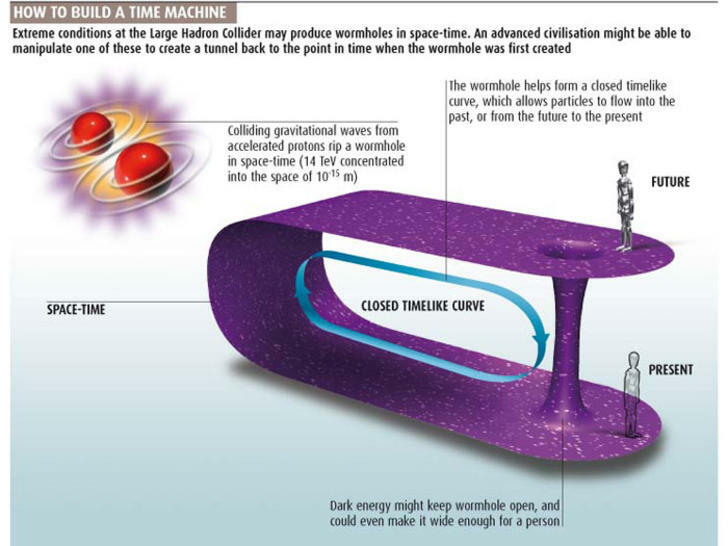 The two “mouths” of the wormhole could be next to each other in space, but separated in time, so that it could literally be used as a time tunnel. Building such a device would be very difficult — it would involve manipulating black holes, each with many times the mass of our Sun. But they could conceivably occur naturally, either on this scale or on a microscopic scale. The worry for physicists is that this raises the possibility of paradoxes, familiar to science fiction fans. For example, a time traveller could go back in time and accidentally (or even deliberately) cause the death of her granny, so that neither the time traveller’s mother nor herself was ever born. People are hard to describe mathematically, but the equivalent paradox in the relativists’ calculations involves a billiard ball that goes in to one mouth of a wormhole, emerges in the past from the other mouth, and collides with its other self on the way in to the first mouth, so that it is knocked out of the way and never enters the time tunnel at all. But, of course, there are many possible “self consistent” journeys through the tunnel, in which the two versions of the billiard ball never disturb one another. If time travel really is possible — and after seven years’ intensive study all the evidence says that it is — there must, it seems, be a law of nature to prevent such paradoxes arising, while permitting the self- consistent journeys through time. Igor Novikov, who holds joint posts at the P. N. Lebedev Institute, in Moscow, and at NORDITA (the Nordic Institute for Theoretical Physics), in Copenhagen, first pointed out the need for a “Principle of Self-consistency” of this kind in 1989 . Now, working with a large group of colleagues in Denmark, Canada, Russia and Switzerland, he has found the physical basis for this principle. The action is a property of the whole path, and somehow the light (or “nature”) always knows how to choose the cheapest or simplest path to its goal. In a similar fashion, the principle of least action can be used to describe the entire curved path of the ball thrown through a window, once the time taken for the journey is specified. Although the ball can be thrown at different speeds on different trajectories (higher and slower, or flatter and faster) and still go through the window, only trajectories which satisfy the Principle of least action are possible. Novikov and his colleagues have applied the same principle to the “trajectories” of billiard balls around time loops, both with and without the kind of “self collision” that leads to paradoxes. In a mathematical tour de force, they have shown that in both cases only self-consistent solutions to the equations satisfy the principle of least action — or in their own words, “the whole set of classical trajectories which are globally self-consistent can be directly and simply recovered by imposing the principle of minimal action” (NORDITA Preprint, number 95/49A). The word “classical” in this connection means that they have not yet tried to include the rules of quantum theory in their calculations. But there is no reason to think that this would alter their conclusions. Feynman, who was entranced by the principle of least action, formulated quantum physics entirely on the basis of it, using what is known as the “sum over histories” or “path integral” formulation, because, like a light ray seemingly sniffing out the best path from A to B, it takes account of all possible trajectories in selecting the most efficient. So self-consistency is a consequence of the Principle of least action, and nature can be seen to abhor a time travel paradox. Which removes the last objection of physicists to time travel in principle — and leaves it up to the engineers to get on with the job of building a time machine. 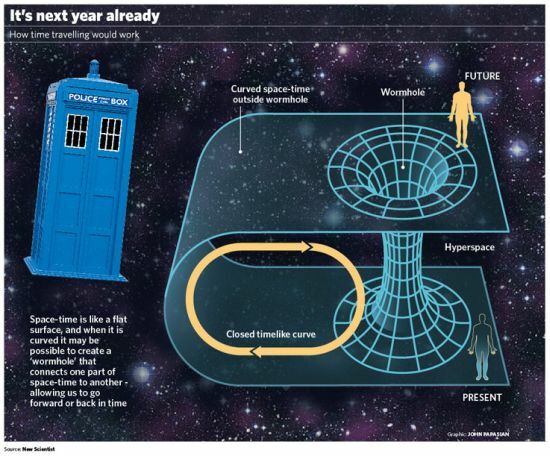 8 Responses to Is Time Travel Possible? Why Time Travel Is Possible? An theory to get around paradoxes is that because everything you do in the past, you have already done, you cannot change the past. For example, you could not kill your grandmother, because you would already have done so, and your grandmother was not killed, so you didn’t, and therefore can’t, kill your grandmother.